Abdelmaaboud started working with us in January 2018. He is originally from Egypt but moved to Greece in 2016 to try and find work. He undertook numerous jobs within the construction industry and could turn his hand to anything, whilst in Greece he met his partner (now Wife) and they both moved to Scotland in late 2017. He first attended SCE back in January where he completed an 8-week ALBA Construction Course. His Trainer noticed straight away that he had prior experience and he had no issues completing the tasks, however his health and safety was non-existent. The main issue was that he struggled with the language barrier, his English was limited, and this would be a major issue due to health and safety within the construction industry. He was referred to Stirling Council by his Trainer for support with his English and we continued to work with him on workplace health and safety issues. A lot of work was focused on recognizing safety signs, manual handling, PPE, Risk Assessments, COSHH and numerous different subjects. We continuously developed his knowledge, and all the while the family were receiving support with their benefits from our Employability Intervention Worker. We then helped Abdelmaaboud apply for ITA funding so that he could fund his CSCS training, test, card and transport to the test centre. Again, he was supported by Stirling Community Enterprise to undertake the training as the CSCS training disk has an audio feature which was ideal because Abdelmaaboud could understand English better than he spoke it. The issue came from the first part of the training, as the SQA assessment does not have an audio feature and the learning material was all written in English. Staff at Stirling Community Enterprise got the learning material in the booklet, translated to Arabic to allow him to prepare for his assessment. This was obviously a great help for Abdelmaaboud! When it came to do the SQA solar test, he sat his assessment in a private room as all questions had to be read out to him by a member of staff whilst the invigilator observed. Abdelmaaboud successfully passed both assessments first time and achieved his CSCS and went on with support do undertake his driving theory assessment and has since passed his driving test. In September SCE arranged a work placement for him with FES, who we had recent success with for another learner. 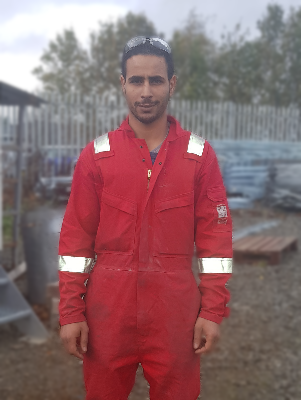 Abdelmaaboud completed a 9-week placement which he attended two and a half days a week, by the end of the placement Abdelmaaboud was offered a full-time position with FES and has since been taking all the over time he can get and has also had a pay rise. Our trainer Sean went to see Abdelmaaboud at FES as part of our aftercare which we do with all our learners who gain employment. Abdelmaaboud has told Sean that the Job has been great, and the family have been fortunate enough to clear all their rent arrears and are getting on so much better. FES had also mentioned that Abdelmaaboud has become a very valuable team member and they are delighted with the partnership with Stirling Community Enterprise.